Can't decide on the best gift for a 17 year old guy? It's a difficult age to buy for. If you ask him, you'll probably get some expensive ideas such as a car or an ipad. ​But if they are out of your budget, the good news is, there are literally hundreds of clever gift ideas that are within your budget. This gift guide gives lot of suggestions and specific ideas to get you thinking about the perfect gift for his birthday or Christmas. This gift is the most popular gift on this page with our readers. The Akaso featured is a fantastic little action camera that makes a fab gift to capture any experiences a 17 year old boy may embark on. It's a small camera that is designed for taking action shots perhaps when cycling, hiking, skiing or doing other sports and activities. Place your action camera into the waterproof case and securely fasten it, then you can dive below 30 meters so it can be used to take shots when swimming, scuba diving, snorkelling or doing other water activities. It comes with lots of mounting accessories so you can attach it to the kit you need to do the filming. It shoots 4K video and has 20MP photo capture. You can easily share your footage on social media by openin the camera wifi and connecting it with your mobile or tablet by app AKASO DV. A lot of teen boys this age have favorite bands and enjoy listening to music. Get him tickets to see his favorite artist in concert. Or what about an itunes voucher? Other ideas include headphones, bluetooth speakers or a shirt with his favorite band on. Check out more specific music gift ideas for teen boys. The other option to never tangle earbuds are wireless earphones. Connect his device to the headphones via bluetooth and he can listen to his music. The headphones have 6 to 8 hours of play time with a quick charge of only 2 hours. They have a wireless range of 33 feet. The headphones are great for when he is doing sport, at the gym, running or hiking. Does he love video games? Unless you are certain you know which games he wants, i would avoid giving him an actual video game as a gift. However, there are lots of gaming related accessories you can buy. A gaming chair, gaming headphones or a novelty gaming t-shirt are all some ideas. Check out some ideas below and more in the gift ideas for gamers article. A virtual reality headset is a super fun gift. And for the price of a google cardboard set it's hard to go wrong. It turns a smartphone into the a 3D device. Play 3D games, watch videos in 3D and explore 3D enviroments. You can then experience the immersive, fun, exciting world of VR and enjoy 360 degree panoramic videos and photos. Enjoy a 3D movie, immerse yourself in a 3D game, experience a rollercoaster ride, hang off the side of the mountain travel through space or walk around a city you are not familiar with. If he is a fortnite fan, than these socks are the perfect gift. They are made of cotton, which is soft and moisture wicking. A nice way to keep his feet warm and comfortable while playing video games. These socks are packaged in a fitted velvet bags so are perfect for gift giving. Gaming chairs are a great gaming gift. They offer comfort, improved sound and a better experience when playing games. Some gaming chairs offer vibration too. Gaming chairs don't have to be just used for gaming. Use them for listening to music or watching TV too. And they are great to have offer as another seat for when friend's come around. There are gaming chair to suit every budget. You can get them from as little $60. A backrest pillow is great to give extra support while sitting on the bed when you're gaming, looking at your laptop or tablet, reading a device or book or watching television. It's a fab gift for him to take to college when he gets a bit older as well. It's also good to give back support when sitting on the sofa or lying on the floor. ​It has a handle at the top so it's easily portable around the home. Books can be one of the easier gifts to buy for 17 year old boys. I would avoid fiction unless you really know what he likes and go for a fun or informative book. There are some great books for teenage boys. I like Man Up! 367 Classic Skills for the Modern Guy. It's a fun but really informative book jam packed full of advice and tips that really are great for any guy. There are tons of topics covered from advice on women (from making the first move to how to break off a friendship when it’is not working any longer) to advice on car stuff (changing a flat, buying a used car), shaving, fashion, grooming, social etiquette, work and jobs, friends, cooking and lots more. Some of the book will be very useful now and other parts will be extremely useful in the coming few years. The great thing about this book is that he can dip in and out of it when needed or when bored. It will teach him things he didn't even know he should know. The Manual to Manhood is another fab gift idea for any 17 year old boy. It's fun and hilarious in places. It's also jam packed full of really interesting advice and information (even fully grown men could do with reading a copy!). It starts off with girls and dating and offers advice on how to talk to a girl - a good start for a teenage guy! It goes on to cover an excellent range of topics from sports (how to throw a ball in every sport), to social skills (shaking hands and making an introduction) manners, tools, fixing things, work (interviews, applications etc), grooming, driving, car maintenance and money management. This is a great read for teens of all ages. I'm 41 and even I've found the information in this book inspiring and interesting. It covers all kinds of important issues including how to choose the right kind of friends, navigating the dating scene, setting goals, dealing with parents, managing money, finding your own identity and lots more. There's lots of useful, practical advice and it's written in a style easily absorbed by teenagers. It's all the stuff you wish you'd have known at 17 and lots more. If he loves to read and hasn't got one already, a kindle paperwhite e-reader is really useful. He can store all his books on there which is a great space saver (no more hard books) and means he can take his whole library easily with him wherever he goes. The paperwhite is waterproof so he can even enjoy his favorite books in the bath. It also has a built in adjustable light, so can be used for reading indoors or outdoors during the day or the night. 17 year old guys often don't have a lot of cash or spare spending money so gift cards and money are often highly appreciated. If you think it's a little bit boring to give a gift card, check out these fun ways to give a teen a gift card. There are tons of electronic gadgets that make top gifts. Some hot ideas include, smart watches, fitness trackers, action cameras (see above), media streaming players, VR headsets and voice activited technology such as the Amazon Echo and Google HOme. For a 17 year old boy, the Amazon Echo a useful gadget to have in their room. Firstly it's a awesome speaker to play music in his room. It has 360 omnidirectional sound. He also can use it to make calls, set alarms and timers and ask informational questions. He can use his voice to control the Echo so just ask for a song, artist, or genre from Amazon Music, Spotify or Pandora and more. The Amazon Echo Dot is a smaller and less expensive version of the Echo. It does a lot of the same things. The main difference is that the dot doesn't give as much powerful sound as the Echo. It's does play music but the speaker is not as powerful. You can either play music directly from the device or alternatively he can connect it to his headphones or speakers via bluetooth and play music from Amazon Music, Spotify, Pandora, iHeartRadio, and TuneIn. The built in speaker can work on its own as a smart alarm clock in the bedroom. The Dot does pretty much everything else the Echo does. It can also be used to provide information, read the news, find out the weather, set alarms, read audiobooks from Audible and control Amazon Video on Fire TV. This is a small size portable charger that will easily fit into a pocket or backpack. It gives extra peace of mind to know that if your phone runs out of battery you can give it a quick charge with this back up and know you can still get in contact with people if you need to. It's also great peace of mind for parents to know that their son can always get in contact with them. It adds over one charge (6 hours talktime) to an iPhone 6, almost one charge to a Galaxy S6 or around one charge to most other phones. The Amzon Fire TV stick is a great gift for a teen to have in his room. It will give teens access to their favorite movies, music, TV shows and apps as well games. The voice search is awesome. Instantly search thousands of movies and TV episodes by actors, directors and film categoires just by asking with your voice. It also has Alexa a cloud based voice service. You can ask Alexa for weather, info from wikipedia, sports scores. order a pizza and lots more. Get all this information just by using your voice. The remote also has new power, volume, and mute buttons to control your TV, sound bar, and receiver. Teens have tons of gadgets to charge. There's his phone, tablet, kindle, laptop, speakers and whatever else he may have. This charger has 6 ports so only one plug is needed for his USB devices. He can keep all his chargers and gadgets in one place ready to be charged in his room. The Qualcomm Quick Charge 3.0 combines with Anker's proprietary PowerIQ and VoltageBoost to deliver the fastest possible charge to almost any USB device. The Echo show is a fab tech gadget that teen guys will find really useful and fun. It's a super portable device meaning it's great to take around the home, use in his room or take to college if he goes in the next couple of years. It's great for listening to music with the premium speakers with Dolby processing. Stream music and books in crisp, stereo sound. Watch videos and live TV and sports with a Hulu subscription, movies and shows from Prime Video. Easily make video calls to anyone with Skype, the Alexa app, an Echo Spot, or Echo Show. Bluetooth speakers will stream your music wirelessly from a phone, tablet or other device with bluetooth. They are great because they are generally small and portable so you can move them around the home, take them in the car, to a friends house or wherever you want. There are all kinds of bluetooth speakers at different price levels. Generally the higher price you pay the higher quality the sound should be, although some of the cheaper speakers offer excellent sound for their size too. Check out a couple of options below. This speaker features the bluetooth technology and will connect with a smartphone or other bluetooth device easily. He can then play his music on his phone through the speaker. The cool thing about this speaker is that is has a sunction cup and is water resistant so he can listen to the music in the bath or shower. It can also be used anywhere else he likes. It also features a built in microphone so he can also enjoy hands free calling. It's small and lightweight so will easily fit in his bag and he can take it wherever he wants to go. It could easily be used as a speaker in the car, use it in the shower, by the beach, in his bedroom or at a friend's house. For a top of the range bluetooth speaker with high quality sound which will stream your music from your phone, tablet or other device with device, check out the Bose soundlink color speaker. This speaker excels at giving rich, deep sound and despite the speaker's small size you can enjoy your music loud. It's super lightweigh and portable so it's fantastic to listen to wherever you are in the home or take it outdoors, to the park, beach, a friend's house - wherever you want to go. The battery life is around 8 hours. There's also an auxiliary input which enables you to connect to other audio sources, like a tablet or MP3 player that don't have bluetooth. There's different color speakers to choose from. Many 17 year old boys enjoy keeping fit and doing sport and this may give you an idea for a gift he may like. For example, if he enjoys playing basketball he may appreciate a basketball themed gift such as a basketball return trainer. Sporty 17 year olds may appreciate sports gear to wear such as new training shoes, a hoodie to wear at training sessions or what about a sports watch? There are lots of cool fitness gifts that are perfect for improving the skills and stamina of 17 year olds too as well as to keep them fit. Ideas include skipping ropes, weight training sets and punch bags. If he likes to workout at home, consider the Iron Gym Upper Body workout bar. It is a versatile piece of equipment. Use it on the floor for push ups, ab work, dips and more. Or it uses levearage to attach to a doorway (no screws required). Then it makes the perfect chin up bar. The bar has three different grip positions wide, neutral and narrow so you can use it to work out all the different muscles. It's a great piece of home gym equipment for building strength and fitness. Building strength is not only good in it's own right, it may help boys improve in their other sports and activities too. It's especially good for teenage boys who may not have enough money for a gym membership. A fitbit is a fabulous gift for the fitness fanatic as well as being extremely practical for any teen that just wants to get a little bit healthier too. Why should you love it? Use it to track steps, distance, calories burned, floors climbed and active minutes. It also measures sleep quality. He can always measure how active he's been everyday. Choose from 15+ exercise modes like run, bike, swim, yoga, circuit training and more, set a goal, and get real-time stats during your workouts to see how you can keep getting better. It can also give you call, text and calendar alerts too when connected to your phone. The abwheel is a great inexpensive piece of home kit that's great to strengthen your core. It also works your s houlders, arms, upper and lower back,and can help work towards a six pack if you want one! It's easy to use, just get on all fours, grab hold of the handles, and glide the wheels back and forth across the floor. ​At various points during the exercise, you'll work every major upper body muscle group as your torso adjusts to the movements. It comes with an instructional fitness guide. Does he like camping, hiking, doing sports based outdoors or just being in the fresh air. There are tons of gifts you can get for the 17 year old who loves being outdoors. From outdoor clothes such as a breathable waterproof jackets to a water bottle with storage to solar powered gadgets such as solar powered speakers or solar powered chargers for his phone when he's on a trip away from civilisation. Another idea for the outdoors type is a multi tool which can often come in useful when camping or on a hiking expedition. Sometimes it's hard to know whether the gift you buy will last and whether it will actually be used. A gift that should be very useful in future years and will last a long time is a Swiss Army Huntsman pocket knife. It features many tools including 2.45" blade, corkscrew, bottle opener with screwdriver, wood saw and scissors. This is a great gift for a teen guy to have available, but especially if he's going onto college soon. A great little accessory to have at his disposal when he needs to cook, mend and fix things for himself. He will also be the go to guy when somebody needs a can opener or a screwdriver! These kind of multitools are also great for 17 year olds who love the outdoors and like to camp and hike. A great accessory to have around on outdoor adventures. Clothes can be difficult to buy and it's often best to get a gift card for his favorite shop.. If you are looking for safe clothing ideas, hoodies and t-shirts are usually pretty easy to buy. Look for labels that he likes to wear and it's difficult to go wrong. Sometimes the fun gifts are the best and can quite often be the easiest to buy. A Jedi bath robe is not only fun, its practical too. Fantastic for watching TV or movies, keeping warm after a bath, playing video games and just generally lounging around. The robe is machine washable and is super comfortable as well. It has a tie closure and features an oversized hood and sleeves. it's great gift idea for any Star Wars fan. This beanie is thick, soft, and large enough to wear over the ears. One size will fit most. The thing that makes the beanie unique is that you can listen to music while wearing it. It features high efficiency bluetooth wireless technology so you can connect to your phone or other device via bluetooth and listen to your music on the go. You can also use the hat for hands free calling. It also features easy access control buttons to manage hands-free calls, wireless music streaming, volume adjustment, fast forward, backward, pause, play, power switch, up to 33 feet. ​This t-shirt is a humorous t-shirt for gamers. The slogan reads "I paused my game to be here". The t-shirt is soft and smooth with a high thread-count, tight knit made out of fuzzy plants grown by American farmers. The t-shirt is available in lots of different sizes. 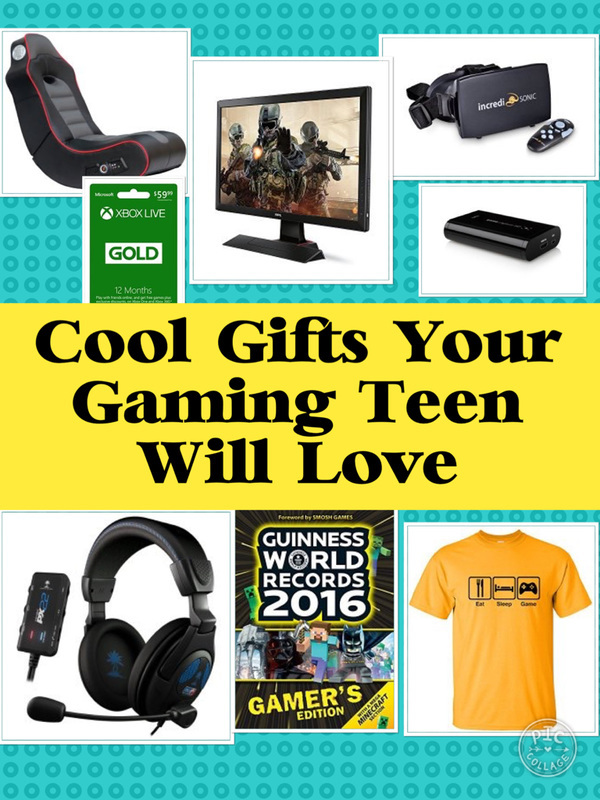 A great gift for any teenage gamer. These men's soccer training pants help you warm up without overheating. Not only good for soccer they are also great for other types of sport and training too. They are super comfortable and can be worn for just chilling out and casual wear too. They feature ventilated climacool and mesh inserts for maximum breathability. A lot of 17 year old boys are studying and for many teenage boys of this age it won't be long until they go off to college. Study gifts might seem boring but there are some great ideas that 17 year old boys will find extremely useful. Ideas include bedrests and laptop desks - so he can study on a sofa or sitting on his bed in comfort. There are also some cool gadgets such as a space pen - check out some ideas here. A space pen makes a unique gift idea and is very handy for students or just to have as a general pen. The space pen can write in outer space but it's also fantastic for use here on Earth too. It can write at any angle (even upside down) so you can lean against a wall to write and the ink will keep flowing. It will also write in extreme temperatures (up to -30F to 250F). A lapdesk is a great idea for a student who likes to study while they're sitting on a couch or a bed. It will allow him to have everything he needs at hand for his studies. The lapdesk featured fits laptops up to 17 inches. There is a phone slot which holds cell phones vertically. The innovative, dual-bolster cushion conforms to your lap, keeping you cool and comfortable. Another ideas is to get gifts for his bedroom or other personal space. Ideas include beanbag chairs for friends to sit on, an indoor basketball hoop to destress and practice a few shots or a bed shaker alarm clock to get him out of bed. Check out some gifts for a teen bedroom. A really cool gift to get a 17 year old boy is a mini fridge which he can keep in his bedroom. It will hold some cold drinks and small snacks for him, his friends or his girlfriend. So he won't even need to leave his room to get some supplies - which is what most teenage guys really want - their own space. This Pepsi mini fridge can fit up to 6 cans and is great for storing snacks, and bottles and cans of soda. It's great for use in his bedroom although there is no reason it couldn't be used elsewhere like an office or a study. If he will be off to college soon, it's also a great little gadget to have in a dorm room. A bedshelfie is a really useful gadget. It attaches to a bed without tools & includes thick felt on touch points. There are two different sizes (the regular and the plus). The one to get depends on how many things you wish to put on yoru bedshelfie. Keep everything you may need within reach. It's made of bamboo which is an incredible renewable source s very eco friendly. Bamboo trees grow very quickly. A fab space saver too. This is great to encourgae teens to pick up their dirty clothes off the floor. It's a hard wearing polyester canvas hanging laundry bag in the shape of a classic boxing punchbag. With a 67 litre capacity, it's big enough to hold a heavyweight load of washing. Great as a storage solution, washing basket and workout aid. It omes with attached fabric carry handle to easily transport to the launderette or downstairs to the washing machine / laundry room. Are 17 year old boys too old for toys and games? Hell, no! Most men haven't outgrown that phase! There are lots of great ideas on the awesome toys for boys page. But also check out the lightning shock reacion reload game below. This game is hilarious fun and suspenseful too. It's a game for 2 to 4 players. Hold onto one of the handles and listen to the music as it plays. When the music stops and the red light turns to green, press the red button as quickly as possible. The slowest player will get an electric shock. But don't press the red button to early as you'll get an electric shock then too. Teenage boys and men love this! There are different levels of electric shock, so the shock adverse can have it on the lowest setting. Lots of fun - great for parties. ​If he's energetic and likes team sports he will probably love spikeball. It can be played pretty much anywhere. Indoors if you have the space as well as in parks, at the beach, when camping or the backyard. It's a fab game for people of all ages to play from kids to adults. Great to play with the family and friends. It's also a fantastic workout for athletic teams who like to train. It's perfect for practicing the hand / eye co-ordination needed for some team games as well. It's simple to play and easy to pick up. The net is placed at ankle level between a pair of two-player teams. You smack the palm-sized ball down on the net so it ricochets up at your opponents. They have up to three hits between them (just like volleyball) to control it and bounce it back to you. When they miss, you score. First team to 21 wins. These one-of-a-kind jelly beans come in 20 flavors—10 tasty flavors and 10 look-alike weird and wild flavors. The convenient spinner gift box turns these jelly beans into a fun game you can play with friends. Take turns spinning the wheel to decide your fate. Is the blue jelly bean delicious berry blue, or is it toothpaste?! ​Each box contains a key of what taste you might experience, but you never know when you’ll be “BeanBoozled” by a weird and wild flavor. If he's driving and has a car it opens up another range of gift ideas for teenage drivers. Check out the driving book below. What a great gift for new drivers. The driving book is an excellent book for those who have not longed passed their test (and for those of us who need a few refreshers). It covers lots of areas perfect for teen lads such as pressures from friends and dealing with your parents. But it also covers the basics of things he should know when driving such as what to do if there is an accident and his car breaksdown, driving down country roads and driving in bad weather. There is lots of informative advice in here covering a wide range of driving topics. There is always a danger that a teen boy's car can get as messy as their bedroom. To avoid this, get him a car organizer to tidy up all his stuff. You can get organizers with dedicated pockets for valuable such as ipads or cellphones too. The High Road SwingAway is a versatile car seat organizer with 8 protective pockets for iPads, tablets, notebooks, smartphones, tissues, water bottles, sanitizer and more. Electric shavers area g fantastic practical gift for a 17 year old. It takes less time to shave everyday than a wet shave so is a good timesaver in the morning. Also although there is an initial outlay, in the long run it shaving will work out cheaper. When choosing an electric shaver for teens, it's good to look for one which isn't time consuming to clean and which is gentle on the skin, offering minimial irritation. The Braun 3 ProSkin 3040s men's electric razor is an excellent option. It offers a impressive motor and battery. An electric toothbrush is definitely a gift that he will use everyday! This brush featured is a rechargeable toothbrush with 2 weeks lifetime between charges. ​It removes 7x more plaque than a manual toothbrush. The pressure sensor protects teeth and gums from excess brushing pressure. 17 year old boys will love experience days such as go karting, paintballing or playing lazer tag. For some activities you could take him and a few friends. If he's mad about sports cars and driving in general why not take him on a race car driving day experience day. Action sports are another idea, bungee jumping, abseiling or canoeing, will all make for memorable days. Or why not take a trip in a helicopter or a hot air balloon? PIf they have everything they need and / or you would prefer to limit the amount of stuff you buy them, perhaps think about getting them an online subscription to a service. You can read on any device, and membership plans are also giftable. There are options of 6, 12 and 24 month plans. You can check out what's available on the Kindle Unlimited library here. The SKLZ reaction ball is a great agility training aid and the perfect size to fit in a stocking. It's great to improve responsiveness, hand eye coordination, reaction time, and agility, It can rebound off of any hard surfaces including hardwood, courts, walls, and infield dirt. It's fun to play with. You can play with it on your own or with a different person. It has six sides and the high-bouncing ball is made of 100% rubber. Is he always losing his phone, his keys and other things. Then he needs tile mate and this thing is the perfect stocking filler size. It is a small device which you can attach to a keyring. If he misplaces his keys he can use his phone to ring the tile mate. It will sound an alert so you can find where they are. If he loses his phone, just press the button on the tile mate and his phone will ring out allowing him to locate it. It works by using the bluetooth on a smart phone. This a great stocking filler or holiday gift for a chocolate loving teen. It is a very big chocolate bar, weight one pound in weight. Eat it all yourself or share with some friends or family members. If you want to give him some cash for his birthday or Christmas, a great way to give it is in a money puzzle. He has to work to get the gift by solving the maze puzzle first. It makes giving money a lot more fun. They are a bit of a challenge but not too easy that it gets solved straight away. They are great for kids, teens and adults.